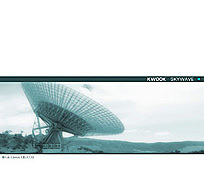 At first, it's hard to say why Skywave (57'47"), the CD by Kwook, sounds so nostalgic. Is it the occasional Mellotron sound? The buzzing lead lines or sweeping synth pads? Or just the overall electronic aura that seems to engulf this album? All of these qualities (as well as a hint of IDM beats) and more make for a captivating release. But it's more the positive attitude of this artist that gives his music its nostalgic feel than any riff or melody. Comprised of subtle yet beautifully varied tracks Skywave glows in transfixing simplicity. The piece "Sunspots" is a standout. With its catchy bassline and melodious flute, it produces an ample amount of momentum and intrigue. A common thread throughout is the insertion of squelchy short-wave radio fragments. These lost communications add the sensation of floating through the ether and are used to great effect in the lengthy title piece, which spans three tracks at the end of the disc. Our friend Kwook believes that "sound is a playground". His inventive approach, full of joy and clarity, makes the journey new.